MacKenzie Contracting Company is pleased to announce the completion of their latest project 18ǀ8 in Quarry Lake. 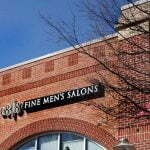 The fine men’s salon hosted a grand opening on Friday, March 13th and is the first location in the greater Baltimore region. The quickly expanding firm is set to open a second location in Annapolis in mid-April. Dedicated to helping men transform the way they look, feel, and perform, 18|8’s stylists provide clients advice, tips, and solutions for their “grooming conundrums”. This attention to detail stems from a commitment to helping clients discover their best self, an obligation that extends through every aspect of an 18|8 salon from the well-educated stylists to the products to the salon itself. To help 18ǀ8 achieve the streamlined and chic feel of the brand, MacKenzie’s Jeffrey Cashman was tasked with bringing a warm “vanilla-shell” space to life. “The transformation of the store with its resilient flooring, custom semi-private stations, strategic lighting, and tasteful finishes, makes this a very inviting place to be pampered,” said MacKenzie Contracting Company Vice President of Business Development Joseph Versey. “We are excited to be a partner 18ǀ8 of as they expand their brand throughout the region”. As part of the overall transformation of the space, MacKenzie provided project management services to ensure water lines and high-voltage electrical systems were not only conveniently located for grooming stations but were optimized to achieve the latest Maryland safety standards. The team was also tasked with creating an accent wall that required multiple paint applications and techniques to achieve a textured finish that could withstand high traffic conditions and remained polished. “The ability to bring to the table not just our brokerage capabilities, but other services, such as contracting, property management, debt & equity solutions, GIS intelligence, creates not only a well-rounded, full service advantage for the client, but provides a seamless experience for what can be a very tedious process. We value our ability to be a “one-stop-shop” and have found it not only gives us a competitive advantage in the marketplace, it creates a sense of trust, loyalty, and long lasting relationships with the ones that matter most – our clients,” said Associate Laura J. Williams. Williams is currently representing 18ǀ8 in their leasing efforts in the Baltimore region. For more information on 18ǀ8, please visit http://eighteeneight.com. For services inquires contact Joseph Versey of MacKenzie Contracting at jversery@mackenziecontracting.com or 443.610.7505.